North America Sheet VIII Ohio, With parts of Kentucky and Virginia. An attractive 1848 full color edition of the S.D.U.K. map of Ohio, Kentucky, Indiana and Virginia. 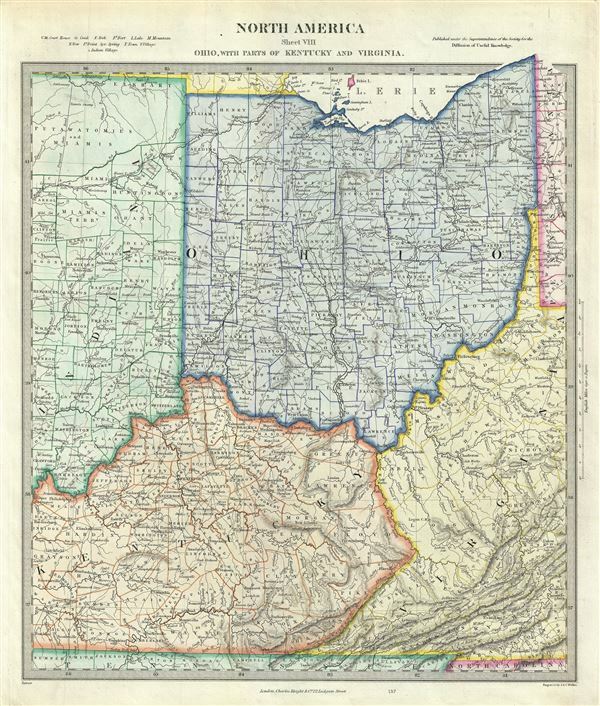 The map covers the state of Ohio in its entirety along with parts of neighboring Indiana, Kentucky and Virginia. The map offers extraordinary detail, noting towns, rivers, lakes, and topography. The map identifies the Indian tribes of Putawatomies and Miamis in northern Indiana. Published in 1848 by Charles Knight of 22 Ludgate Street for the Society for the Diffusion of Useful Knowledge, or S.D.U.K. This was most likely the last edition of the S.D.U.K. atlas to be published before the society formally closed its doors. However, it is known that subsequent reissues of the S.D.U.K. atlas were printed well into the 1870s by Chapman and Hall, who acquired the original plates. Rumsey 0890.135 (1833 edition). Phillips (Atlases) 794.